Th UE Roll 2 is a small, rugged follow-up to the UE Roll with significant audio improvements over its predecessor. It also boasts an improved wireless range of up to 100 feet from its previous version of 65 feet. This rather unique and creative wireless speaker comes with a clever sound balance helping to insure quality sound at all volumes across multiple music genres. It sounds great, look fun and offers maximum value for each penny you invest. One feature that really stood out when I was researching for this UE Roll 2 review is the fact that it doesn’t only tolerate water splash but it’s completely waterproof. Waterproof speakers are here to stay, and I can assure you it’s neither a passing fad nor a gimmick. They are actually becoming a staple of the market as most users are now appreciating their stress free advantage at poolside parties, damp weather conditions, and any other outdoor use. You would normally expect very little bass when dealing with these size of speakers. The UE Roll 2, however, seems to have hit all the sweet spots when it comes to sound quality, design, and functionality. I won’t hesitate to recommend this to anyone looking for an affordable, compact and out-of-the-box waterproof wireless speaker. 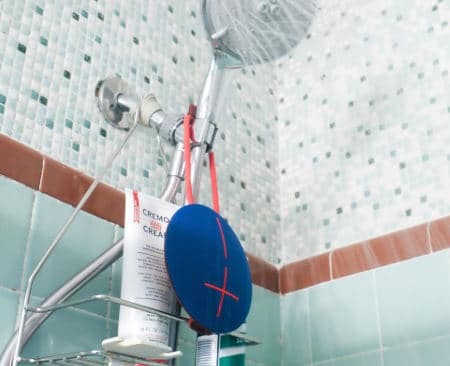 Lets take a closer look with our UE Roll 2 Waterproof Speaker Review. The Roll 2 looks and functions more or less like the original UE Roll. The 5.3-inch disc measures 1.6 inches at its thickest point, with front and back sides that curve toward each other to form a single circular edge. It weighs 328.8g and is rated IPX7 waterproof, meaning it can handle total submersion in 3.3 feet of water for up to 30 minutes. I don’t know why you would want to listen to music 3 feet under water, but the point is it’s practically waterproof. 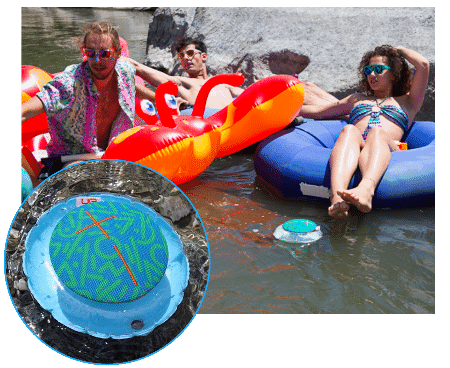 While you won’t be able to actually listen to music under water, it comes with an inflatable cushion that keeps it afloat when you take it into the pool. Just blow it up and secure a speaker on it using the provided strap. Like most of UE’s speakers, the Roll 2 is available in a variety of bright colors including orange/blue, black/red, magenta/yellow, blue/red, and two different patterned versions. The front side of the Roll 2 is covered entirely in fabric which also doubles up as a protective grille, with large minus and plus symbols for volume control. The back of the speaker is made of rubber. The power and Bluetooth pairing buttons sit on the back next to the micro USB and 3.5mm auxiliary ports. Flipping the cover reveals a smooth transition from fabric to matte rubber. The back also hosts a built-in bungee loop, along with a hook to keep the bungee in place when it's not being used to dangle the speaker. The Roll 2 comes with a nine-hour estimated battery life similar to its predecessor. You also get a free app with features like Remote On/Off. ​The Roll 2 is sturdy and is likely to survive a day at the beach as it is a day bouncing around in your bag. The UE Roll 2 uses different drivers compared to what other small Bluetooth speakers usually use. It doesn’t have bass drivers, but it has a fairly large 2-inch main driver and two little 0.75-inch tweeters. The sound quality is pretty great; it can go from zero to maximum volume without any major distortion. It has clear and crisp treble and mids too for this kind of speaker. This is mainly attributed to the fairly large main driver used in speakers bigger than this size. The lower end of the sound volume is surprisingly solid and meaty for a speaker this size. The drum kicks and baselines are clean and delivered with a powerful punch that will make your head nod. The bass isn’t as robust, but the guitars and vocals will sound beautiful throughout the entire track especially when played at average volume. When you max out the volume, you will still get a clear and detailed sound profile. The highs are more than above average, nicely spaced and do not become piercing. The UE Roll 2 is a great improvement over the original version with 15% louder sound and a better Bluetooth range of up to 100 feet. It also has a cleaner and crisper sound quality. Instruments sound like they have a lot more room to breathe which translates to a better experience. Compared to the sound quality from speakers in the same price range, the Roll 2 is entirely in its own league. Not to mention that the disc shaped design is still just as unique and practical now as it was with the original, and it’s also just as easy to recommend. If you love this design but you don’t necessarily need a waterproof speaker, or maybe you just need a little more bass, then you might want to try the UE Boom 2. The bungee cord gives an option to cling to places that most portable speakers can't. Plus, an IPX7 rating means it has no problem taking a quick swim if someone accidentally kicks it into the pool. On top of that, the companion app offers several additional features, most of which are useful. No doubt there are other options out there but, if you want a speaker with a wild design, exceptional clarity an unbeatable wireless range at an affordable price, you should try Ultimate Ear’s Roll 2.